The new and fantastic town centre mosaic has caught the interest of a lot of Colchester’s residences. It has also been a great tourist attraction so far. Both tourists and locals alike have been in aw of the said mosaic. We here at Clearhaven made it our duty to find out more about the latest attraction. And what we have found out is just incredible! Not only does this mosaic carry a lot of history behind it, it is also a one-of-a-kind artifact. With a bit of research and reading, we were able to find some great information about the Middleborough Mosaic. All thanks to the Gazette News, that is! Philip Crummy, of Colchester Archaeological Trust, tells us more about the Middleborough Mosaic. THE fanstastic Middleborough Mosaic which you featured was in fact found during our excavations, not during the later building work. We mounted a full-blown excavation covering most of the site beforehand. The results were of great interest and parts of two Roman houses, a Roman street in between, a well-preserved Roman kiln, later medieval kilns, and the remains of two medieval houses showed how busy and different the area had been over the years. We were also able to record Newmarket Tavern’s timber-frame in detail so as to relate the above-ground building to the complicated and informative archaeological sequence of floors, hearths and ovens below. I love your picture which shows the site with the Newmarket Tavern standing in the foreground. We are in that picture too. The little polytunnel to the left of the Newmarket is ours. We used to put these little plastic covers over parts of our sites so that we could keep going regardless of the weather. The Middleborough mosaic is a highly-decorated and fine example of the Roman art of mosaic-making. We invited the public to come and see the pavement on two successive Saturdays late in the summer of 1978. We were delighted when 2,700 people turned up to admire its wriggling sea beasts, perching birds, and wrestling cupids all neatly bound as one by a network of intricate geometric and floral scrolls. Maybe you were one of our visitors? 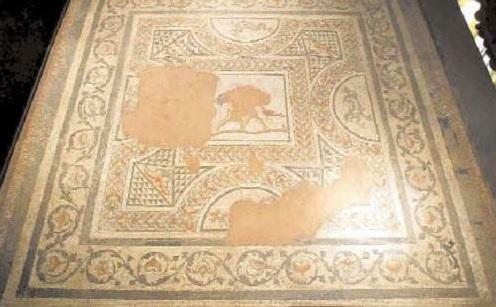 You can now see the mosaic in all its glory on the first floor of the Castle Museum.